Directly print files to your Canon iPF imagePROGRAF printer without having to open them in another application. You can also share files via cloud storage. If you want and easy way to view, print, and share your large format files, Canon's imagePROGRAF Direct Print & Share is the answer. 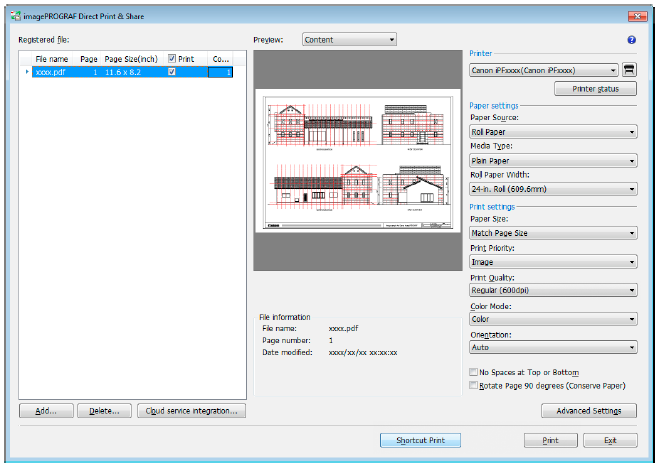 This free large format printing software application easily connects to a Canon imagePROGRAF printer and gives you the power to literally manage your files from anywhere in the world. Prepare to experience wide-format printing freedom! Experience Powerful Printing with Canon Direct Print & Share! Have questions? Contact one of our wide-format advisors for more info.